Rusty and Lisa Echols are a prophetic, apostolic couple that have been married for nearly 35 years. 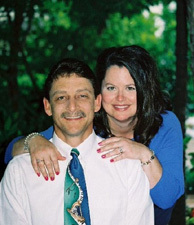 They are the founders of Joy Springs Ministries, Inc., and served as pastors together for 7 years. They live a life of worship, and the anointing to lead others into His presence is evident in their meetings as the prophetic gifts flow through them. Rusty is a gifted worship leader and guitarist. Lisa is a published author of an autobiography and two training/discipleship manuals. Together they have discipled students in the word and devotion to intimacy with Christ. Many of their students have been ordained at the completion of the training courses as they discovered their gifts and callings. The Echols are passionate about developing others in their lives and ministries, hence the apostolic anointing they share. They have served in prison ministry, as well as many outreaches to the community in which they live, including LAM (Love Across Monroe). This is an annual outreach to lower income families during Christmas and Easter with gifts for the children. They are conference speakers and worship leaders, and have assisted other ministries with teaching and leadership training. Both are gifted in the arts, such as mime, expressive worship, drama, flags & banners, and have choreographed revelatory, anointed productions. The Echols have been actively involved in Georgia Right to Life with public speaking and worship. Lisa served 2 years as a volunteer for Gwinnett Crisis Pregnancy Center, and has served as the VP of Walton County Right to Life for 6 years. Rusty and Lisa have one daughter and 2 granddaughters, who also reside in Walton County, Georgia.